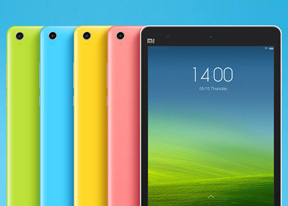 The Xiaomi Mi Pad 7.9 is the first device to bring the quad-core Tegra K1 chipset to the market. While the Cortex-A15 cores have shown they can post good scores we're mostly looking to see what the Kepler-based 192 Cuda-core GPU can post up. The first tests are GeekBench 3, Basemark OS II and AnTuTu 4. All of them stress the CPU as well as the system (read-write speed, the lot). The Tegra K1 has four Cortex-A15 cores clocked as high as 2.22GHz, which is very high for this type of core (it usually runs below 2GHz). There's a third-generation battery-saver core but that one doesn't play a role in our testing. The chipset is built using a 28nm process, which should allow the chipset to be more power-efficient. The Snapdragon 800, 801 and 805 are all 28nm, while the Snapdragon 808 is built on using a 20nm fabrication process but hasn't made an appearance on any device yet. Geekbench 3 puts the Tegra K1 in first place, ahead of the Exynos and Snapdragon rivals. AnTuTu 4 also gives the nod to the Tegra K1 over everyone else. The Snapdragon 801 inside the Samsung Galaxy S5 lags far behind in both tests. Finally, we have Basemark OS II, which tests both single and multi-core CPU performance and gives an all-round chipset score. The latter shows the Tegra K1 inside the Xiaomi Mi Pad 7.9 as the best performer out of the elite company but single and multi-core show its CPU to be far less impressive. Now for the Tegra K1's forte - graphics. The GPU inside the K1 is built on the Nvidia Kepler architecture, which powers some very high-end desktop cards. It supports DirectX 11, OpenGL 4.4 and can run the Unreal Engine 4. The GPU has 192 Nvidia Cuda cores and supports display resolutions of up to UHD resolution (that's 3840 x 2160 or 4K in laymans). The Tegra K1 chipset has the most pedigree here and should have superior performance to its competition and it does. Gaming graphics benchmark Basemark X shows a score twice as high as any of the competition. GFXBench's onscreen and offscreen T-Rex 1080p and more-intensive Manhattan 1080 tests give an almost unanimous lead for the Kepler architecture and 192 cores of the K1. The on-screen tests show the raw processing power of the GPUs and the Tegra K1 beats the Adreno 330 by a huge margin on T-Rex and twice as good on Manhattan. The GPU inside the Apple A7 chip doesn't have a chance in this battle. The Tegra K1 is the first device we've tested that shows an almost stutter-free Manhattan test with 27.3fps - that's as close to a fluid 30fps as a mobile device has gotten so far. It's certain that the quad-core Cortex-A15 processor can provide stellar power, owning the CPU tests but it's the graphics test that deem the Tegra K1 the most powerful chip around. The Xiaomi Mi Pad 7.9 can play very intensive games without breaking a sweat, pumping out as many fps as are needed to get a fluid, stutter-free experience. The only issue is that while you're tasking the GPU or CPU with heavy lifting the Mi Pad 7.9 would get really hot - something, which can be attributed to Xiaomi's poor choice of heat-distributing materials.